Lk. 2:6-8 Jesus is born in Bethlehem in 6 or 5BC. He is laid in a manger – an animal’s feeding trough – as there is no room for Mary and Joseph in the accommodation available. Traditional nativity stories usually feature an innkeeper turning Mary and Joseph away with the words, ‘No room in the inn’. Yet there is no mention of an inn in Luke’s account of Jesus’s birth. Luke actually tells us there was no place for them in the guest-room. The Greek word usually translated inn is ‘kataluma’, but it actually means a guest-room (see Luke 2:7). It is precisely the same word that is used to describe the upper room or guest-room where Jesus and his disciples shared the Last Supper in Jerusalem on the night before Jesus was crucified (see Luke 22:11). Many larger family houses in Jesus’s day had their family quarters on the ground floor and a guest-room (often added later) on the upper storey or on the roof. The family’s livestock would also be housed on the ground floor, or sometimes in an adjacent cave or underground cellar. Luke records that Mary and Joseph travelled to Bethlehem because Joseph’s family came from Bethlehem. It is likely, therefore, that Mary and Joseph went to stay with their relatives in Bethlehem. While Romans and other foreign travellers often stayed in roadside hostelries or ‘inns’ (see Luke 10:30-35), Jews never stayed in 'inns'. For a start, the food wasn't kosher (it didn't meet Jewish food laws) (see Leviticus 11:1-47), and Jews were forbidden to eat with Gentiles (non-Jews) (see Acts 10:28). Instead, Jews always stayed in the homes of relatives or other Jews when travelling (see Luke 9:4 & 10:7). Finding that there was no place for them in their family’s guest-room – maybe because Joseph’s elder brother and his wife were already there – they were probably asked to share the lower room where animals were normally kept. As a result, the newborn baby Jesus’s makeshift crib was a manger – the feeding trough for the animals. 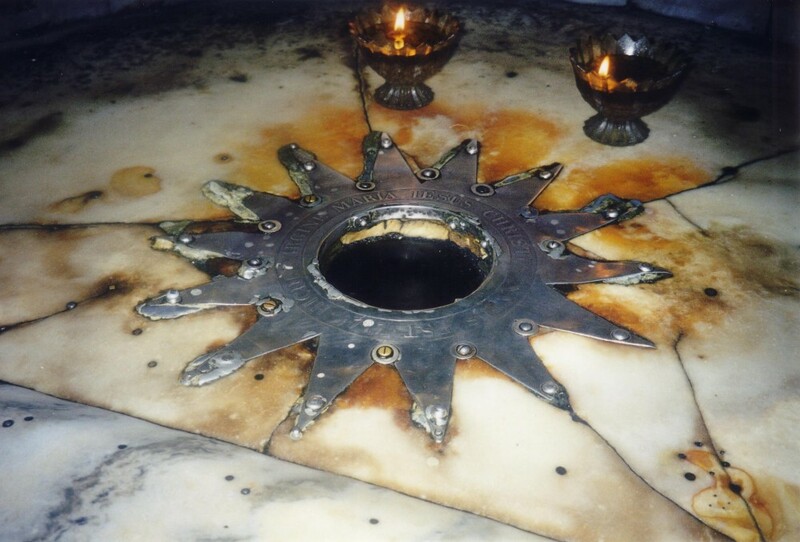 No one can be sure exactly where Jesus was born in Bethlehem (Hebrew, ‘Beit Lekhem’, meaning ‘house of bread’), but the Church of the Nativity marks the traditional site. The church, which can still be visited today, was erected by Helena, the Roman Emperor Constantine’s mother, at the spot where Christians in the 4th century AD believed that Jesus was born. They told the Empress that, after Hadrian had expelled the Jews from Bethlehem in 135AD, he had planted a grove of trees sacred to the Roman god Thammuz (Adonis) here in order to destroy the site that was venerated by Jewish Christians in the first century AD. The church – started in 326AD and dedicated in 339AD – is the world’s oldest church that is still in regular use today, though the present church was extended and modified in 529AD by the Emperor Justinian. Ancient mosaics dating from Byzantine times (from the Eastern Roman Empire during the 5th or 6th century AD) can still be seen beneath the present floor level. The main altar is built above a series of caves, one of which may have served as a stable at the time when Jesus was born. Descending the steep steps behind the altar, visitors are greeted by the site of the manger, and by a silver star nearby bearing the Latin inscription, ‘Hic de Virgine Maria Jesus Christus natus est’ (‘Here Jesus Christ was born of the Virgin Mary’). To the south east of the church, visitors can enter the ‘Milk Grotto’, a cave hewn out of white rock where it is believed by some that Mary nursed the infant Jesus before the family escaped to Egypt to flee King Herod’s wrath.